There are six mandatory items that must be on every label. Your employees need to be able to recognize these changes. Employees must know the meanings of GHS pictographs which graphically indicate hazards in the chemical product. MSDS becomes SDS. Your employees must know where to find the SDS sheets in your facility and understand the 16 section format. Under the OSHA GHS, the definition of "Employers" are manufacturers, distributors, and cleaning service providers. This required training includes anyone in your company who works around chemicals or handles them, including sales staff, warehouse, and office personnel, if they have occasion to handle cleaning chemicals. Use this link to set up a training account for each of your employees. The online video training is about 20 minutes and employees can complete it in their own timeframe. It is the program suggested by the ISSA, but you do not need to be an ISSA member to access it. 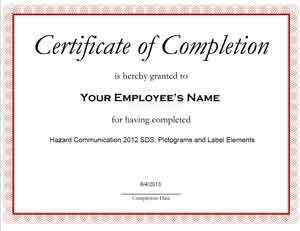 After completion of viewing the video, your employees take a short online test and are provided a "Certificate of Completion" that can be printed off for record-keeping. The completion is also noted on the training website.